As you are editing your Excel workbooks, one of the most common actions to take is to clear or delete cells. Clearing cells means erasing everything within them, whereas deleting actually deletes the entire cell (or cells). This may sound like an odd distinction, but it is not really. If you compare the cells in your worksheet to paper cups, you can either remove a cup entirely (deleting the cup) or simply remove any contents from the cup (clearing the cup). When you delete a cell, the other cells around that cell move to fill where the cell used to be. Clear All. Everything related to the cell except the cell itself. Clear Formats. Any formatting applied to the cell. Clear Contents. The information in the cell. Any formatting and comments remain in place. Clear Comments. The comments attached to the cell. 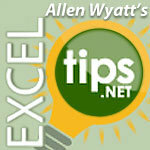 Excel Tips excel, excel.tips.net, Microsoft Excel. permalink.